As a business owner you can use Bartercard to pay for services like, your accountant, marketing, goods and services, holidays, property, restaurants or cafes. Our Travel Team offer all Bartercard NZ members free travel advice for both business and pleasure, specialising in New Zealand and the Pacific Islands. There have been a number of changes to the NZ legislation recently, find out what your legal obligations are when conducting business on the Bartercard Trade Exchange. We explain Bartercard for small business owners and provide you with information on the benefits and how to get the most out of Bartercard. Join the thousands of cardholders who buy and sell online everyday. Access over $40,000,000 worth of products on Bartercard Marketplace. 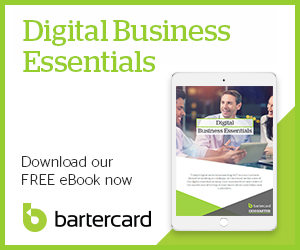 In order to confidently advise on how Bartercard can grow your client's business, we have written this eBook. Get the most out of your membership by using your trade dollars for not only business, but personal spends as well. Relax at your local cafe or service your car at the mechanics. Find out what our members have to say. Bartercard Property offers a marketing advantage by putting like-minded Buyers and Sellers together using Bartercard to facilitate the transactions. Invest in your future. In order to be truly effective as a small business owner, it's time to start working on your business rather than simply in your business. © 2018 Bartercard New Zealand. All rights reserved.